Follow Paddington and his nose for adventure as he finds himself out at sea, performs an impressive magic trick, paints a masterpiece, and more! Michael Bond’s classic character, Paddington Bear, has warmed the hearts of generations of readers with his earnest good intentions and humorous misadventures. 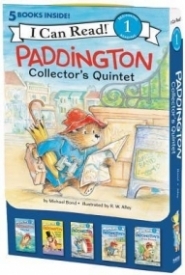 Paddington Collector’s Quintet contains five fun-filled Level 1 I Can Read storybooks in a sturdy box with a Velcro closure and plastic handle—perfect for your beginning reader to take on the go! Books included: Paddington Sets Sail, Paddington and the Magic Trick, Paddington Plays On , Paddington’s Day Off, and Paddington’s Prize Picture. All of the books in this set are Level One I Can Read books, which means they are perfect for children learning to sound out words and sentences. The PADDINGTON COLLECTOR'S QUINTET features five classic stories: Paddington Sets Sail, Paddington and the Magic Trick, Paddington Plays On, Paddington’s Day Off, and Paddington’s Prize Picture. All five of them are unique in their own way and feature the popular and lovable character Paddington. In these stories, the reader will follow Paddington through his his adventures like going to the beach, visiting France, and celebrating a birthday. This collection is the perfect gift for those who love Paddington, especially after the movies have come out. I think my favorite story was Paddington Sets Sail because it includes fun activities at the beach like a sand castle building contest. It ends with Paddington as the star all because of a pail. Final Verdict: I love this collection and sharing it with my daughter. I would recommend it to fans of Paddington, bears, and adventure. "THE EVILEST OF THEM ALL talks about all things villains. It goes through the popular ones like, Jafar, Ursula, Maleficent,..."
"AQUAMAN: THE JUNIOR NOVEL is a great companion to the movie that is designed for children. It isn't as intense..."
"This book is a Guide to Atlantis, Arthur style! There are "taped" notebook pages and doodles that show Arthur's humor..."
"This board book features absolutely gorgeous designs that celebrate, primarily, the settings from the ANNE OF GREEN GABLES series. Counting..."
"ANNE’S ALPHABET features gorgeous images of hand-embroidered scenes from ANNE OF GREEN GABLES along with a letter and term that..."
"LITTLE BEAR WANTS TO GROW is a beautifully illustrated children’s book about patience. Little Bear is eager to grow up,..."
"ANNE’S FEELINGS features scenes from the iconic ANNE OF GREEN GABLES along with specific feelings, including hopeful, scared, surprised, happy,..."
"This board book features lovely images made out of hand embroidery that feature scenes from the classic, ANNE OF GREEN..."
"WHAT I LOVED: AJ is your average kid and doesn’t have anything exciting going on in his life, but he’s..."